Juno is a handsome five-year-old black and white Siberian with baby blue eyes who loves to walk and run with people (on leash of course) and just be part of the family. He loves tug of war and chasing balls. Juno is smart ~ he knows sit, rollover and paw. He is a friendly boy and does jump up as a friendly gesture if allowed. For this reason, we recommend a home with children eight years and older. Juno was a happy part of a family of four, which over time became a one-person home. Juno missed the household activity and his remaining person had to travel frequently so he spent much of his time in kennels resulting in anxiety. Juno is looking for a home where he can be part of the family and enjoy everyone. 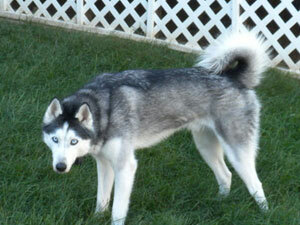 He has an excellent temperament and is friendly with people and other dogs. He has a moderate energy level, although he lives up to the husky name and is a counter-surfer and will escape if allowed the opportunity. Juno’s human loves him very much, but he knows it is in Juno’s best interest to belong to a household that will give him the time and attention this social boy thrives on. If you have an opening for a fantastic companion and friend, please ask for more information about this wonderful Siberian.